To get to meet Kathy, go to YouTube and type in "The Grumpy Old Dog Lady". Here you will find her video blog (Vlogging), where Kathy talks about various dog related topics we are sure you will enjoy. Positive reinforcement methods using luring and by rewarding -verbal and with treats. Private home consultations for behavioural problems. Private obedience training at home. K C Dog School started out as a part time business for Kathy, until 1994, when it became a full time business. From small beginnings, K C Dog School has grown into a well know training school in the northern suburbs. Kathy has had many years of experience in the dog ring with different dog sports, as well as judging not only locally, but overseas as well. Kathy has given lectures for Dog Dancing and Clicker and Behaviour in the USA. Both Kathy and senior assistant, Staci are accredited Companion Animal Behaviourists, and the other assistants have all been involved with dogs for several years. Our philosophy is to guide the handler and dog through exercises with lots of love and praise and treats in order to get a closer bond, with the ultimate aim for the dog to do what the handler asks it to do. Walking nicely on a lead with left, right and about turns. When the owner stops, the dog will sit. Fast and slow speeds are included. The dog will walk to a blanket and lie down on it. To do a sit stay. When the owner walks backwards, the dog will recall to the front, and then finish. A socialization “control” exercise - dog has to “leave” the other dog alone when it is passing by. This course is done on lead, and the owner uses lots of praise and luring and treats to motivate the dog. On registration, the owner receives a treat bag and bag of soft treats (to use at the first lesson). For further lessons the treats are available to be purchased. Working on the skills learnt in the basic obedience course. Starting to work off lead. Off lead recall - leave the dog, walk away and recall to the front and finish. Taking the skills learnt in the previous classes and moving forward with interesting things. Going to different areas in Forest Farm and doing fun things - recall up and down the stairs. Preparing the handler and dog for the KUSA Canine Good Citizen tests. These are done twice a year. Doing “RallyFree” moves. Doing these moves to music. This class is ongoing. You can stay for as long as you like. I have several owners who have been coming over 8 years! For beginners - a new piece of equipment is taught slowly. together for a final full run on the course. 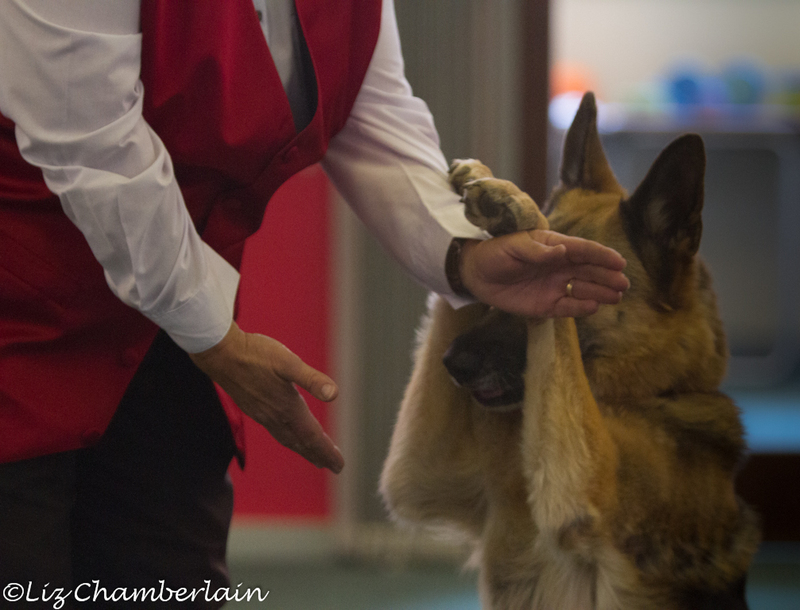 The handler is taught the basics of clicker. A variety of tricks are taught and the dog can work through the levels of “Do More with your Dog”. Obtained: Novice, Intermediate, Advanced, Expert and Champion Trick Dog Titles with Border Collie, Teagan.